With the warm weather upon us, I have to say, I love me some arugula! If you’ve never tried it, it’s a spicy, flavor-filled herb. Until I read up on it I thought it was a lettuce, but It’s actually a cruciferous vegetable (same family as broccoli and cauliflower). Arugula isn’t only SO tasty and refreshing, it’s packed with antioxidants, minerals and vitamins. A cup of arugula contains .52 g of protein, .13 g of total fat, .73 g of carbohydrates, .3 g of fiber and .41 g of natural sugars. All of these values per cup are minimal, BUT at 5 calories per cup, arugula is truly a low-calorie food. You would need to eat nearly 20 cups of arugula to get the calories afforded by a single medium-sized apple! Arugula’s healthy amounts of dietary fiber help to create a feeling of fullness, and may help avoid snacking…aka the basics of healthy weight loss, FABULOUS! Vitamin A (475 IU/cup) – Vitamin A is a fat-soluble antioxidant vitamin, needed for vision, bone growth, the division and differentiation of cells and proper immune function. Beta-Carotene (285 mcg) of beta-carotene, a vitamin A precursor that turns to retinol –a natural form of vitamin A — in your body. Lutein and Zeaxanthin (711 mcg/cup) – Researchers believe that these antioxidant plant pigments can help prevent macular degeneration, an age-related eye disease. Vitamin K (21.7 mcg/cup) – Essential for the proper clotting of blood and maintainance of bone density. Vitamin K is currently being studied for potential applications in treating Alzheimer’s disease. 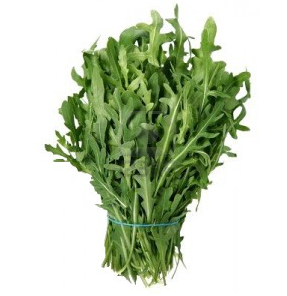 Arugula has high levels of a sulfur-containing compound called glucosinolate. According to studies chopping and chewing arugula turns glucosinolates into indoles and isothiocyanates. These enzymes have cytotoxic effects on cancer cells and may help to protect against breast, prostate, cervical and ovarian cancers. Just like Hippocrates said, “Let food be thy medicine and medicine be thy food.” Damn, my man was smart! I love arugula in salads with avocado, tomato, cucumber and when I’m feeling like some added protein I throw in some grilled chicken. I top it with balsamic vinegar and a drizzle of olive oil. You can use arugula in place of any of your favorite lettuces in salads or sandwiches. If you want some clever ideas for your arugula you can check out yesterday’s Huffington Post for 15 tasty lookin’ recipes. Click HERE to check ’em out. This entry was posted in FIERCE FUN, FIERCE HEALTH, FIERCE- ISH and tagged arugula, health, minerals, nutrie, nutrients, nutrition, salad, vitamins, weight-loss by GETFIERCE TRAINING. Bookmark the permalink.